The following guest post is by my roommate, Kevin. As we all know, I'm a terrible bread maker. Well, not terrible exactly, but it's definitely not my forte — whereas I can churn out beautiful cakes just like that, my bread often looks flat and misshapen while tasting dense and doughy. I've always made it a resolution to get better (Anybody remember Bread Month on this blog? Nope? Me either. What about the three times I declared that I would get better at baking bread? ), but life always keeps getting in the way. Kevin, on the other hand, knows and understands things about dough that I don't. 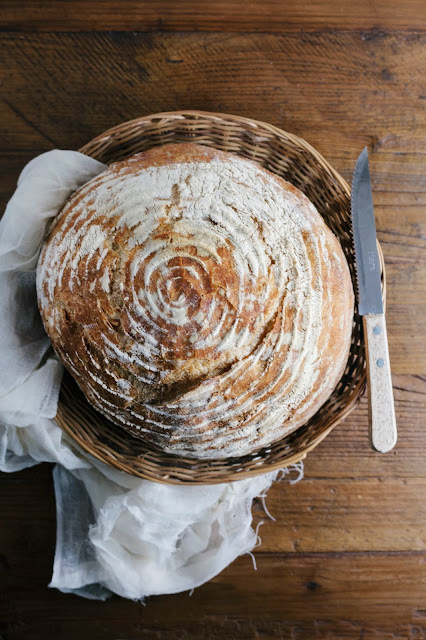 He effortlessly churns out beautiful, well risen breads with golden crusts on a weekly basis. Almost every loaf he makes has a perfect open crumb, with a gorgeous crackly crust. His bread is absolutely delicious, especially when fresh from the oven and served with some butter and salt. Making bread is pretty easy. Of course, there's always more to work on, but the basics are remarkably accessible and the product looks good and tastes better even from the beginning. Honestly, I still feel a little guilty when somebody compliments a loaf that I baked. I don't wake up at four in the morning or knead the dough until my wrists get sore. I don't have a sourdough start in the back of the fridge that I regularly feed or hum little songs to. I just put four ingredients in a big tupperware, mix it all around a bit with a wooden spoon, wait, shape it, bake it and eat it. 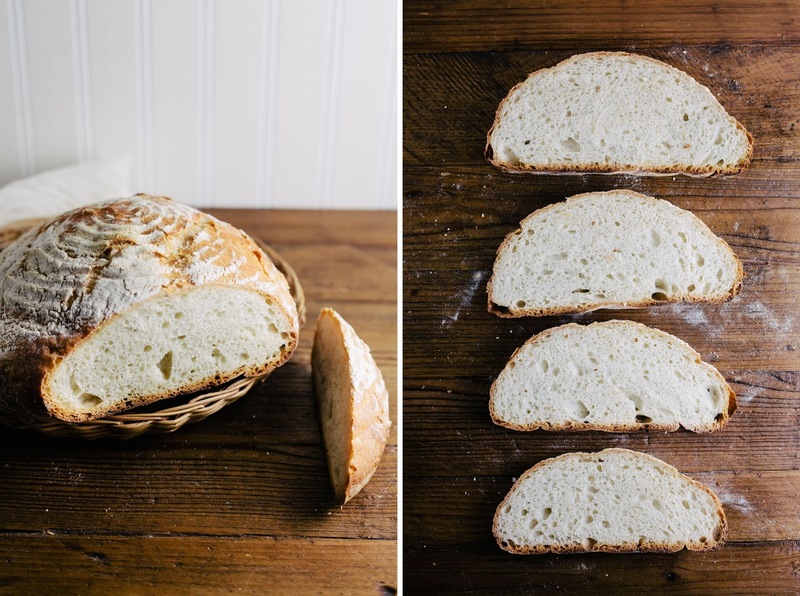 It took me a long time to realize that these first steps of the long climb to bread mastery are a totally guilt-free, acceptable, and (mostly) non-sacrilegious way to make a good bread that's better than what you'll find at the supermarket. Unfortunately, the simplicity of this foundation can be hard to spot under the shadow of the edifice it supports. Cracking open a book of bread recipes, it's easy for the uninitiated to get overwhelmed by the vocabulary: proofing, hydration ratios, barms, bigas, sponges, and starts. Sure, there are plenty of great resources to read about these things. In fact, you'd probably never run out of them — and that's the problem: rather than just diving in and baking, it's easy to get the feeling that you've got a lot of homework to do. But if you're like me, you can just skip all that, start in the middle with some sort of multi-grain pâte fermentée, and fail. And not fail spectacularly so much as... well, just imagine the sound of a spoiled sourdough start flopping into the compost bin and you'll have a pretty good onomatopoeia for the feeling of bread-making gone wrong! And to think that I'd been feeding the damn thing for a week and a half. It's not easy for a beginning baker tackling a complex recipe to find the cause of a problem, so start simple. Once you have a working baseline, it's a lot easier to tinker with things. If you're making adjustments to a recipe that you know already works, it will be a lot easier to diagnose any issues you have with the final product. To do this, you’ll need a baseline recipe. The first recipe that I found that worked for me was the adaptation of Jim Lahey’s no-knead bread recipe featured in the Dining and Wine section of the New York Times (side note from Michelle — I tried this recipe too, but my bead was never as good as Kevin's!). As far as the home-baker is concerned, this recipe has two big advantages going for it. 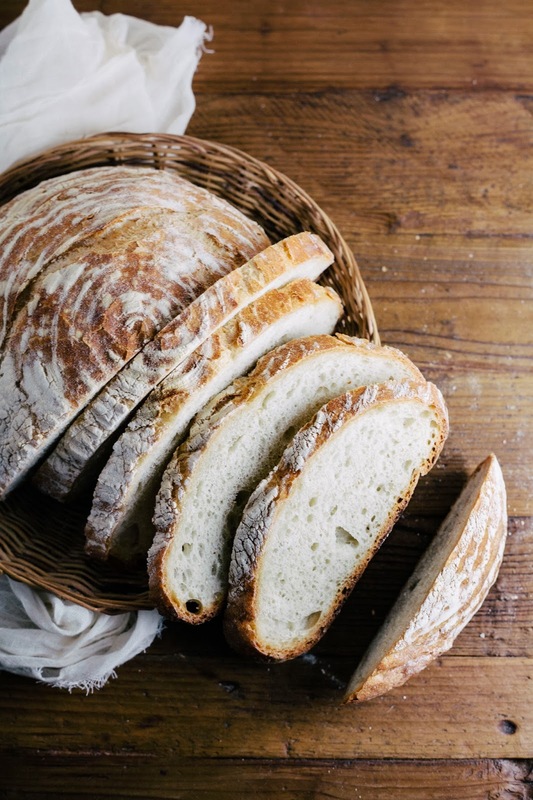 First, rather than requiring kneading the to accelerate the development of gluten in the dough, Lahey’s recipe simply includes a longer resting period — allowing the gluten to develop at its own rate. This is a bit of a trade-off: a longer overall bake time, but a much shorter hands-on time. Second, rather than requiring a bread-machine or a professional high-temperature oven, this recipe suggests using a heavy covered pot to get a similar effect at a much lower temperature. The pot traps steam, so you don’t have to worry about the steam dish suggested by some recipes. 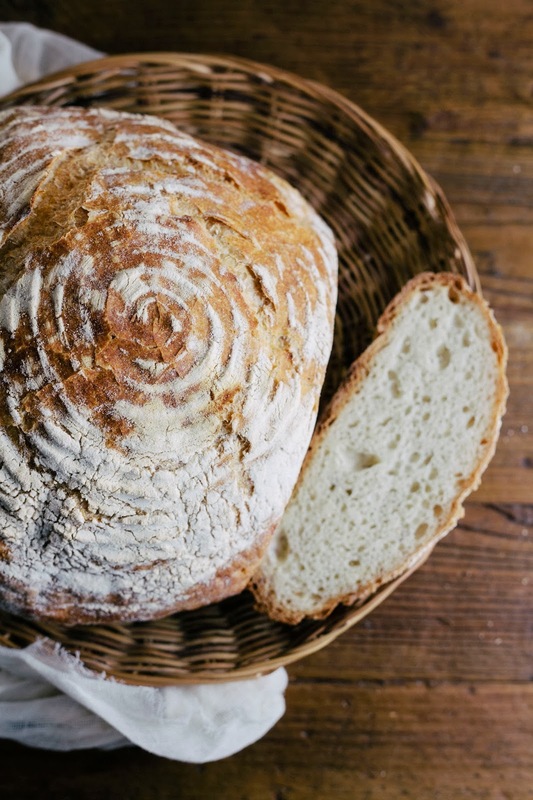 Additionally, if you use a heavy Dutch oven or clay pot, it will act like a breadstone and contribute thermal mass, giving you a crispier crust. However, if you work all day, scheduling the long rise can be a bit of a hassle. This recipe from The New Artisan Bread in 5 Minutes A Day is another great one that I’ve found, and I highly recommend it. I’ve kept a couple things I like about Lahey’s recipe — mostly using a Dutch oven — but worked in a lot of the time-saving techniques from Jeff Hertzberg and Zoë François’ book. It turns out that you can cut down the suggested 12-18 hour rise time significantly and get a similar effect. Furthermore, by making a high-hydration dough in a resealable container, you can save your dough away in the refrigerator for surprisingly long periods of time (as long as two weeks!) and still get good results. And before I get to the recipe, a warning: the most grievous error a beginner can make is to mistake aspirations for imperfections. There's nothing wrong with chasing the dome-topped loaf with a custard crumb and crispy crust, but if yours turns out a little flat or the crumb isn't as open as you hoped, you'd be wrong to think that you failed. Archaeologists think people have been making breads from natural grains since well before the agricultural revolution of the Neolithic — something like 30,000 years. And you just made yours! It's fun to set goals for yourself, but the idea that there could be a right and wrong way to bake bread is absurd. So here's the real test: cut off a slice. Slather it with butter or jam, if you like, and take a bite. Is it good? Then you’ve got nothing to worry about. Bake on! Combine the water, salt, and yeast in a mixing bowl or large tupperware. I like to put my container on top of a kitchen scale and tare it so I can easily add up the weights as I go. Add in the flour, and mix with a wooden spoon until the ingredients are evenly combined. If you're using a tupperware, set the lid on top, but don't seal it — you don't want the cover to be airtight. If you're using a bowl, loosely cover the top with plastic wrap. Let the dough sit for a minimum of two hours. Leaving it longer — even overnight — should be fine. At this point, you can either continue on to the next step, or refrigerate the dough and use it in the next two weeks. If you do refrigerate it, leave the top loose for a couple days before sealing it. When you're ready to bake, take out a piece of dough about the size of a grapefruit. You'll want to use some flour on your hands and the surface of the dough to keep it from sticking too much, but try to avoid incorporating the added flour into the dough. At this point, you want to keep as much gas in the bread as possible, so don't punch it down or knead it. Instead you want to form what Hertzberg and François call a 'gluten cloak.' Holding the dough in both hands, you want to stretch out the top of the ball and pull the bottom together. The top and sides should be smooth and cohesive. The bottom will seem a little messy — that’s okay. It will flatten out and come together as the dough rests and bakes. If you're using a cast-iron Dutch oven, any lightly floured surface will do. If you're using a baking sheet, put the bread on it to rest — this way you can just move the whole tray to the oven when you're ready to bake. And if you're using a baking stone and have a pizza peel, make good use of it! Let the dough rest for about 40 minutes. About half-way through the rest, put the Dutch oven (or baking stone) in the oven and preheat to 450 (F). If you set the lid of the Dutch oven to the side or on the bottom rack you can allow it to preheat without having the extra step of to take it off before you can put in your dough. This might sound nitpicky, but the cast iron will be quite hot and heavy, so minimizing the number of steps is as much a matter of safety as convenience. Note that if you're using a baking tray, the thermal mass is negligible, so you won't gain anything by pre-heating with it in the oven. Bake for 30 to 35 minutes, or until the crust is a rich brown. If you're using a Dutch oven, take the top off about 20 minutes in. This lets moisture escape so that the crust can crisp. See how long you can let the bread cool before trying a slice. The bread continues to cook after you take it out of the oven, so cutting into it can harm the texture. In the book, Hertzberg and François suggest that letting it cool for about two hours is ideal. I try to make bread from scratch once a summer when I have the time off from being a teacher... maybe this summer it will be my goal to do it 4 times to perfect it.... These tips will be helpful! Hi Hanna. Not a stupid question, but yes, you read right: no kneading necessary. Gluten generally does a good job of developing without much stimulation, it just takes a while. Letting bread rest for longer also allows the flavor to develop, so going the no-knead route is win-win as far as I'm concerned. I just made your recipe and it is wonderful! As someone just beginning her bread baking adventures, this was a great place to start! Do I need to grease or flour the dutch oven?